microwave circuit simulators. 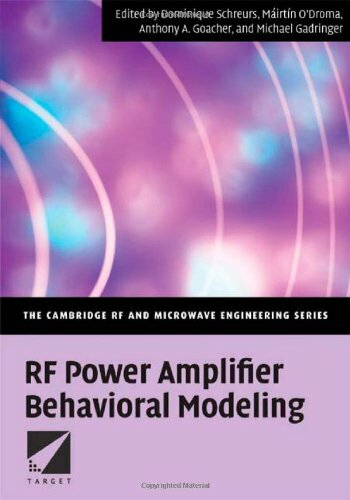 It is suitable for academic researchers, graduate students and engineers working in PA modelling or for RF designers using such models. Dominique Schreurs is a full professor at KU Leuven, Leuven, Belgium. Previously, she has been a visiting scientist at Agilent Technologies (USA), Eidgenï¿½ssische Technische Hochschule Zï¿½rich (Switzerland), and the National Institute of Standards and Technology (USA). Dominique's main research interests concern linear and nonlinear characterization and modeling of microwave devices and circuits, as well as linear and nonlinear hybrid and integrated circuit design for telecommunications and biomedical applications. She is the technical chair of ARFTG and serves as the editor of the IEEE Transactions on Microwave Theory and Techniques. Mï¿½irtï¿½n O'Droma is Director of the Telecommunications Research Centre, and Senior Lecturer in the Department of Electronic and Computer Engineering at the University of Limerick. A Fellow of the IET and Senior Member of the IEE, he is a founding partner and steering committee member of TARGET (Top Amplifier Research Groups in European Team) and a section head of the RF power linearization and amplifier modeling research strand. Anthony A. Goacher is the Research Manager at the Telecommunications Research Centre at the University of Limerick, Ireland. Michael Gadringer is a lecturer at the Technische Universitat, Wien in Austria.